Coming from triathlon, where we swim 2.4 miles, bike 112 miles, and then run a marathon, I might not have given enough respect to competitive runners. After all, I think it was 13-time Ironman Champion Chrissie Wellington who remarked about the marathon, “There’s a special mystique about the marathon, for example, because of its length — but that’s just the bit you do at the end of an Ironman”. 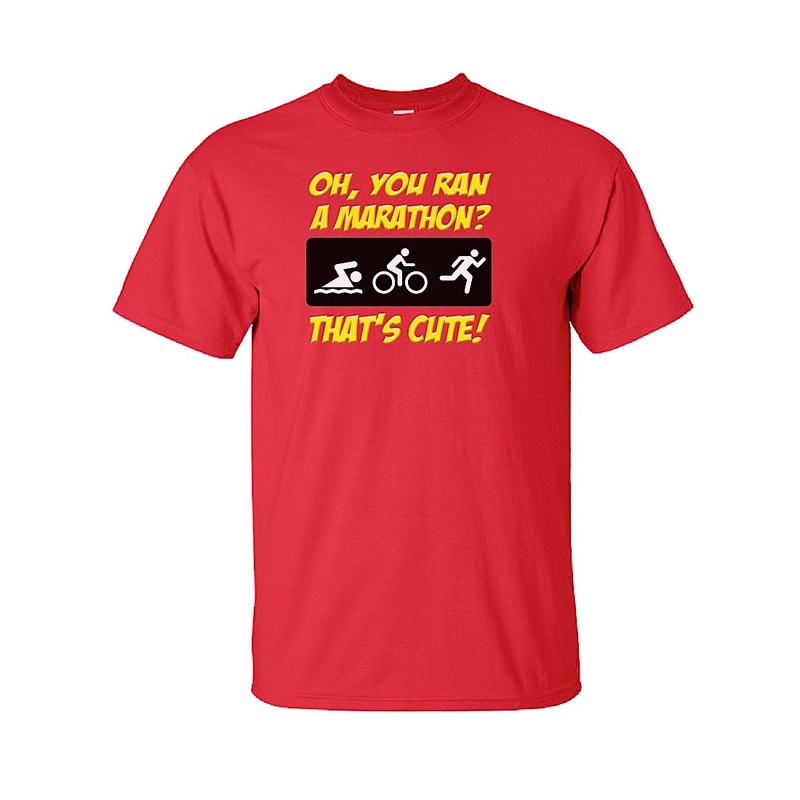 And then, of course, there are the triathlon shirts referring to marathons as “cute”. But after sharing the course with some of the best marathoners in the world, I must change my tune. Motivational speaker Eric Thomas says: “Everybody wants to be a beast. Until it’s time to do what beasts do”. 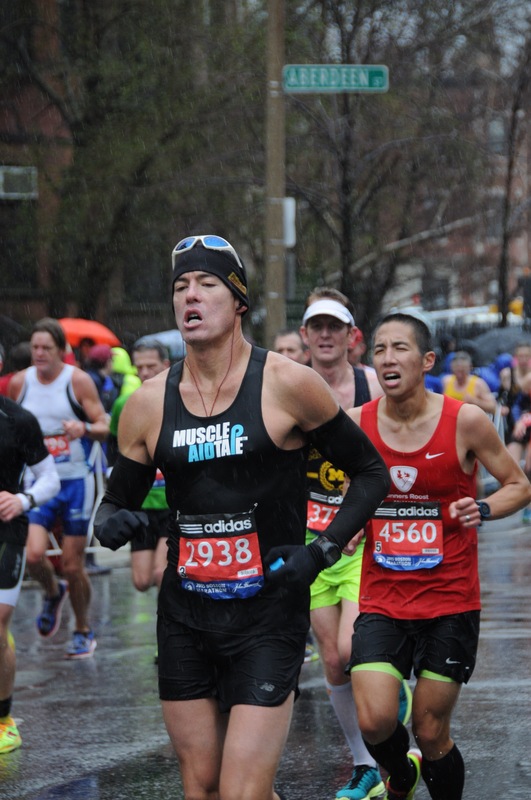 I bore witness to many beasts, male and female, at the Boston Marathon. They fought, clawed, suffered, persisted. Some blew up before reaching the line. And others triumphed. 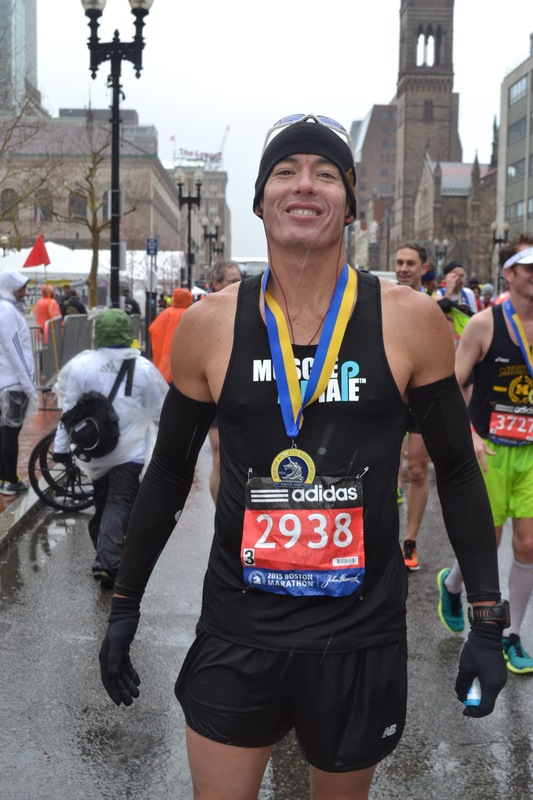 While I arrived in Boston with great reverence for the Boston Marathon, I’m leaving with an even greater reverence for the Boston marathoners. Underestimating their commitment to hurt is a mistake I shall not make again. and then, 19 hours later, I was at the start line for the LA Marathon. My legs were heavy. My body was fatigued. But as per Kurt’s instructions, I was to run a sub-3. 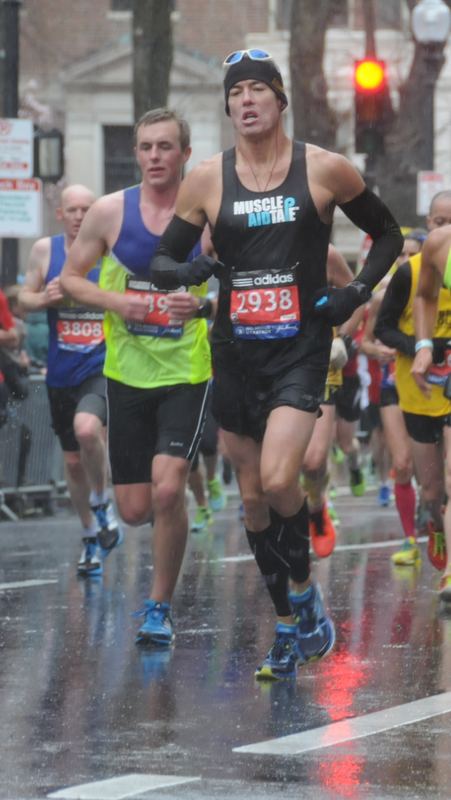 I went 2:58:01, which Kurt found satisfactory, and I learned later that it qualified me for the Boston Marathon. 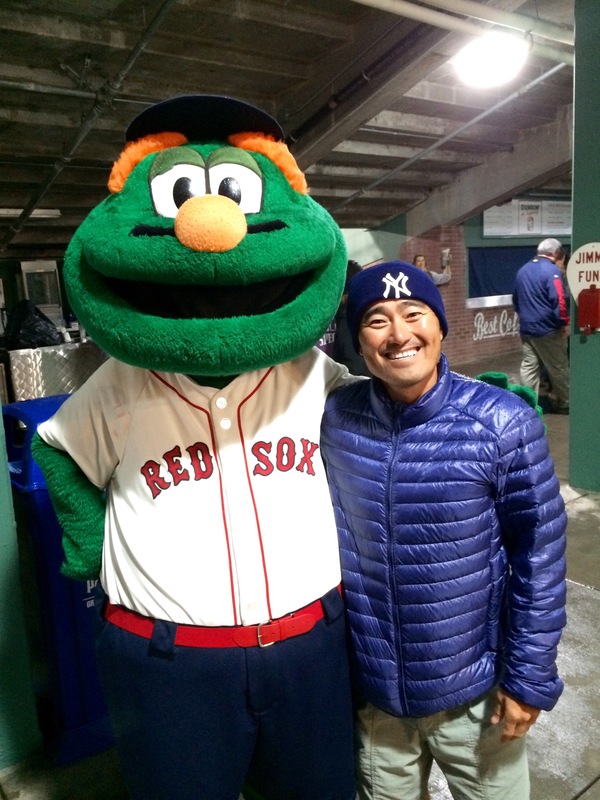 So smash-cut to Boston. It’s me, Keish, and Kyle. (We are teammates on Team TriBike Transport). The weather is bone-chilling cold. But it’s warm at the expo. We take the subway to the Hynes Convention Center to grab our stuff. They give us lanyards, color-coded race numbers, a morning clothes bag, and a yellow long-sleeved shirt. We make an effort not to overeat at the expo, as there is a lot of free food, including fairly large hunks of grilled pork. I overheard a couple of teenage boys say, “I love this expo. Let’s just hang out by the pork booth”. (I don’t think they were racing). Keish, Kyle, and I engaged in some light loading of pasta and chicken-meatballs. I believe the dinner before an important race should carry one objective: don’t get sick. So I knew we were pushing our luck at a free, race-organized buffet. Michelle made some fun additions to this photo for social media: The thing about Boston is . . . it’s cold. It’s just so cold. People say I love the heat, but that’s not it. It’s simply that given two choices — sweltering heat or teeth-chattering chill — I’ll take the warm climate every time. 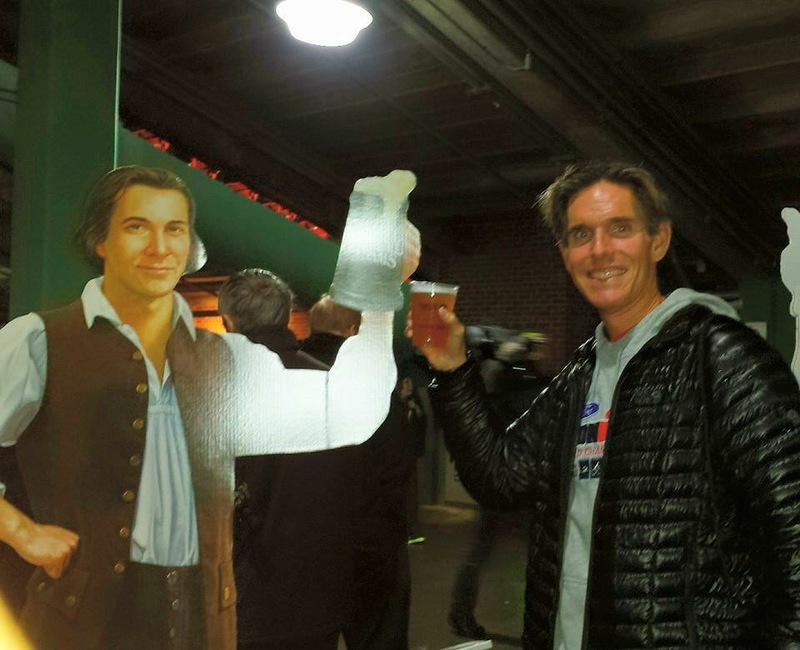 The race starts at 10:00 AM on Patriots’ Day. I was keen to do a race with a 10 AM start time, as I thought I’d get to sleep in a bit. Unfortunately, I still set my alarm for 4:00 AM. And then, due to pre-race nerves, I tossed and turned from 3:00 AM until approximately 3:49, when I finally arose to greet the day. and then walk to the park to bag the clothes we want to keep (holding onto the clothes we plan to race in and the clothes we plan to discard at the start line). Kyle picked up a few items at H&M the night before, items he planned to discard at the start, items that would eventually be donated. Next was the athlete bus to Hopkinton (a 1hr. 7 minute ride). By the time we reached Hopkinton, it was 7:45 AM and so, so cold. Even with two trash bags and a Mylar sheet underneath, I was not comfortable. It started to rain, and we quickly sought refuge in a large tent. We were packed in among hundreds of athletes. Many were cold. Some were coughing. (I tried not to think about how conducive this environment was to the spread of infectious disease. If I could take a snapshot with my eyes, it looked like a color photo of the black-and-white Civil War tents, where soldiers with compromised immune systems would congregate in an unconscious effort to spread Staph and other ailments). Once 9:10 AM arrived, it was time to make the pilgrimage to the start line. We walked almost a mile, cheered by locals who’d assembled make-shift pre-race aid stations outside their homes, replete with coffee, Vaseline, sports drink, etc. I was in Wave 1, Corral 3. If I had a chance for a do-over, I’d have lined up in the front of Corral 3. Instead, I lined up in the back. Historically, I tend to underestimate my goals and my ability, especially within the context of those around me. In this case, I learned that my goals did not mesh well with my compatriots. 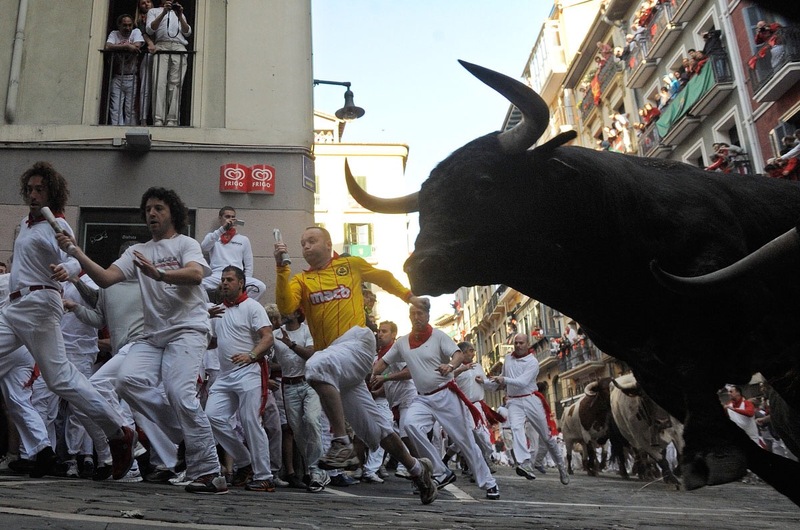 it was sort of like the footage you see from the Running of the Bulls in Pampalona, Spain. Not the footage where the runners have plenty of room but are stupidly running next to the bull, taunting it with a rolled up newspaper. What I’m referring to are the runners who are effectively blocked by slower runners who are clogging up the corridor. 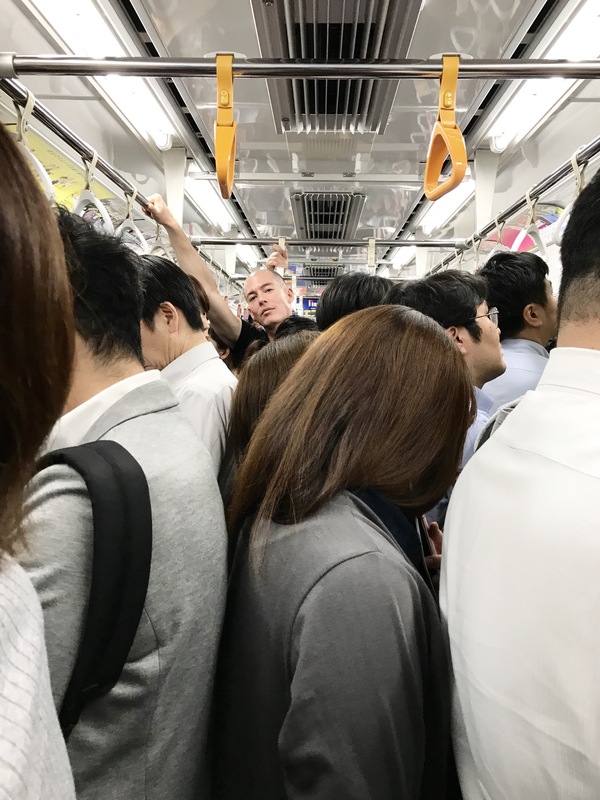 There are runners, clad in all white except for a red scarf and red sash, jockeying for a gap to open, for a line they can slip through, lest they get speared by a bull. My bull was my goal, and it was about to trample me. My goal was to go sub-3 hours. I’d put in quite a lot of training for this race. I even tapered, easing off my bike training in the seven days leading up to the race, and reducing my run volume and swim volume as Monday’s race grew closer. So here I was, stymied by my own decision not to place myself closer to the front of the corral. I was blocked by a mob of marathoners running a 6:50-7:00/mile downhill. If I simply wanted to finish, this wouldn’t be of great consequence. But when you’re aiming for a time goal, and when you know you’ll be especially hard on yourself in the days and weeks following the race if you don’t meet your time goal . . . well, every second counts. For 2 miles, I tried to be patient. This is not one of my strengths. 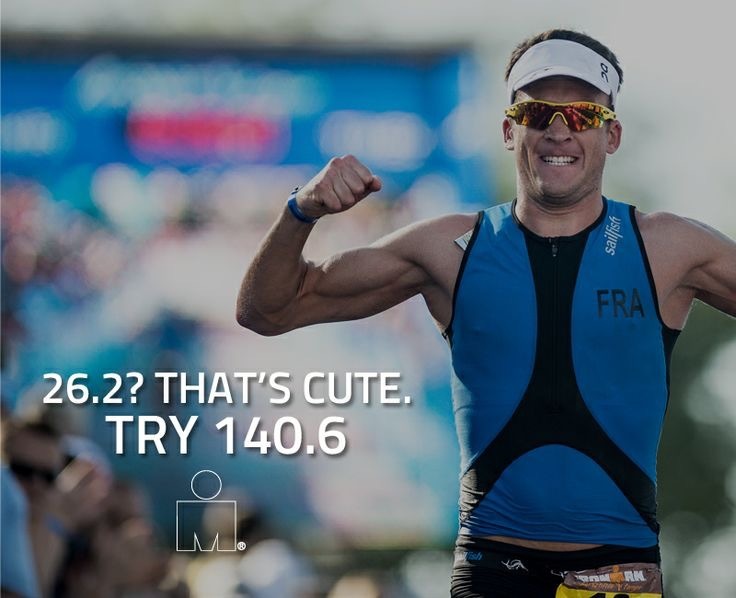 I’d toggle from looking straight ahead to looking at my watch, knowing that my average pace needs to be under 6:51 if I want a sub-3 hour finish. (My first mile was completed in 6:52). I had to do some math in order to determine the delta between the pace I was going, what I needed to be going, and how much time I’d need to bank for the slow sections. (Doing math while running is also not one of my strengths). Miles 2, 3, and 4 were run in 6:33, 6:30, and 6:20. Things hadn’t thinned out, but I found myself among people who were running with a sense of urgency. As some of you know, I like to shorten overwhelming distances by breaking them into bite-sized chunks. For this race, I borrowed a page from Coach Patrick McCrann’s playbook. Some of you might know him by his nickname, Iceman, or you may remember him from my Ironman World Championship Race Report, as he beat me by one second. Coach Patrick also wrote an article for this blog’s Secrets to Success series. 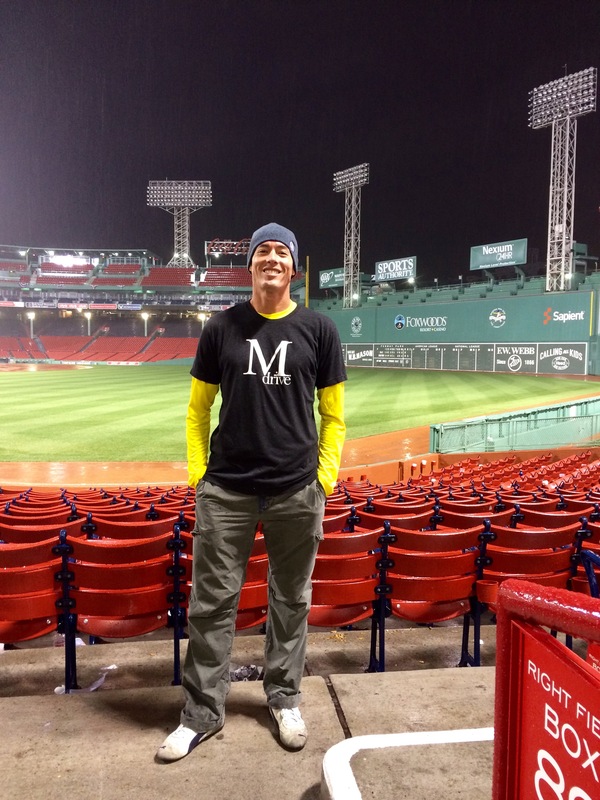 In addition to being co-coach for Endurance Nation, he coaches Marathon Nation. Coach Patrick’s suggestion is to chunk the course as follows: Miles 1-5 downhill, 5-16 rolling, 16-21 hills, 21-26 downhill to flat. So there I was, clicking off 6:30-6:35 miles. Bang on. No struggle. Just tick-tock, tick-tock, tick-tock. I felt smooth, fluid, light, and fast. Then came Mile 10. The rain started to come down hard! And with the rain came an increased headwind. The group I’d been running with thinned out, and it became tough to tuck in behind those who might shield me from the wind. Rain was now pelting my face. My tank top was soaked, as were my shorts. Most troubling, though, were my socks. Running in wet socks is rarely conducive to blister-less feet. I started doing the math. 16 more miles in wet socks. We’re gonna lose some toenails today. I’m no stranger to negative thinking, and I knew that if these thoughts were a precursor to my performance in the subsequent miles, I’d need to change my state. Fast. So I enlisted the crowd. I’ve seen estimates indicating that 500,000 to 1,000,000 people lined up to cheer on the athletes. 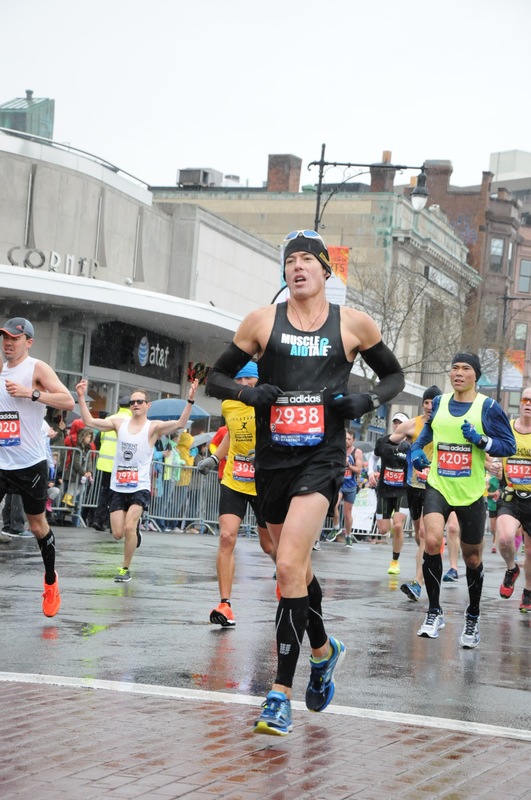 What I know is that just about every inch of real estate along the point-to-point course was occupied by passionate supporters, who were shouting words of encouragement, chanting “Boston Strong,” and stretching their arms over the barricades to hi-five the athletes running by. I made a beeline to the right side of the road, where I ran along the barricade hi-fiving as many people as I could. Their passion affected me, and my state started to change. I started running faster and more fluidly. By Mile 12 I was feeling better. And that’s when we entered Welleseley. I’d heard about this section, as the Welleseley college students (Welleseley is an all-women’s liberal arts school) are known to offer kisses to Boston marathoners. One of the things I don’t quite understand about marathons is why they don’t have food and Coke at the aid stations. In Ironman, aid stations offer a proper smorgasbord of cookies, pretzels, potato chips, energy gels, energy bars, energy chews, chicken broth, Gatorade, water, and cola. 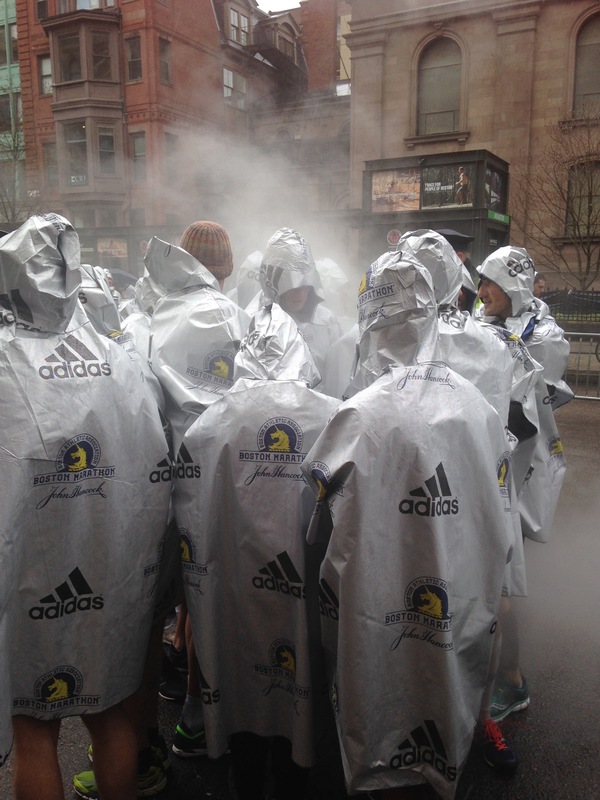 The Boston Marathon, not unlike the LA Marathon, or the Rock ‘N Roll Marathon in San Diego, offered water and Gatorade at each aid station. And at one aid station (at Mile 17), there were gels. That’s it! This might be why you rarely find spectators handing out food to athletes in Ironman. Each aid station offers plenty! 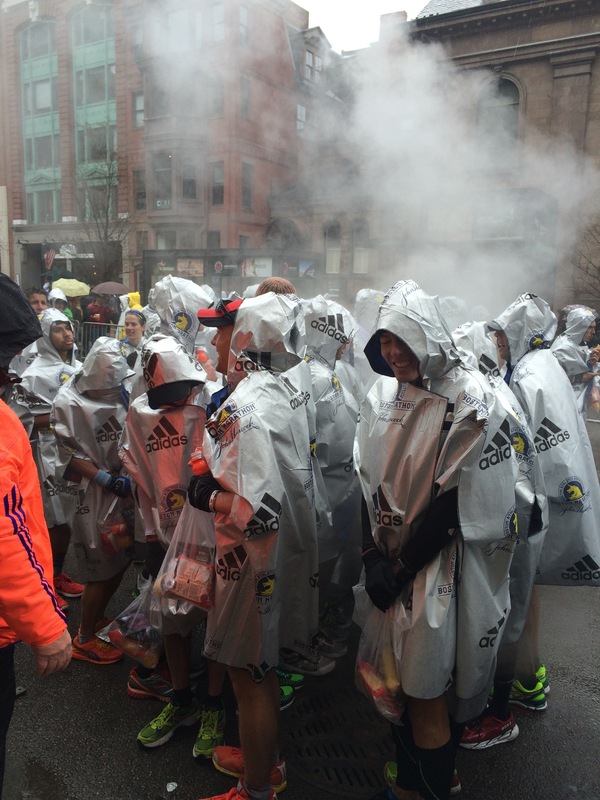 But at Boston, there were heaps of spectators handing out oranges, licorice, beer. It’s as if the aid stations are subsidized by the spectators. While I didn’t grab any oranges or licorice, my eyes lit up when I reached Mile 15 and saw the aforementioned Coach Patrick, holding a Coke. It’s been said many times before, but you don’t go to Coke early. You wait. And when your mind and body no longer wish to cooperate, when you need a boost, Coke seems to be among the best sports drinks out there. I snatched his Coke, continued running, and chugged half of the bottle before placing it next to a volunteer at the Mile 16 aid station. I felt renewed. But I also needed to pee. This had been lingering since the start, but I originally attributed it to nerves. 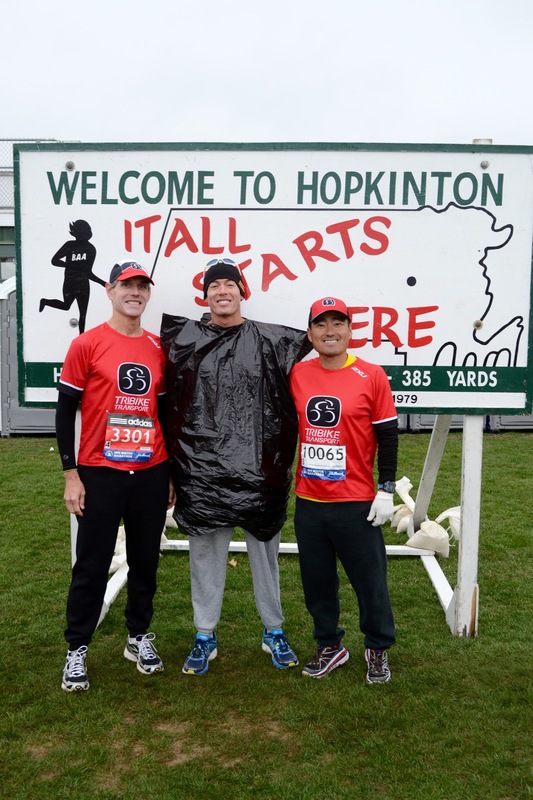 There were many porta-Johns along the course, and they were reserved for athletes. My average pace was starting to slow a bit, due primarily to the hilly section (Miles 16-21). And I had three choices: stop to pee, keep running, or pee on myself while running. I darted into a porta-John. Steam rose from my urine stream. I did my business with great urgency and got back out onto the course. Still, this bathroom break cost me 2 seconds per mile in my average pace, so it was time to run with renewed vigor. This was the hilly section, but I attacked it. And all was good until Mile 18. All of a sudden, it was like both of my quads had been placed in a vice. And the vice was squeezing and squeezing. Something sinister — probably muscle fatigue — was turning the crank tighter, tighter. I went from feeling light and capable to heavy and on the verge of big-muscle seizure. I tried to run from my glutes. I shortened my stride. I stopped lifting as much with my knees. This was all to prevent a quad or hamstring cramp. One big muscle cramp typically takes me one minute to recover from. It squeezes, and I need to wait for it to relent before I can move again. The problem was, I didn’t have much time. One minute was no longer in the cards. In other words, in the next 8 miles, if I cramp, my race is over. 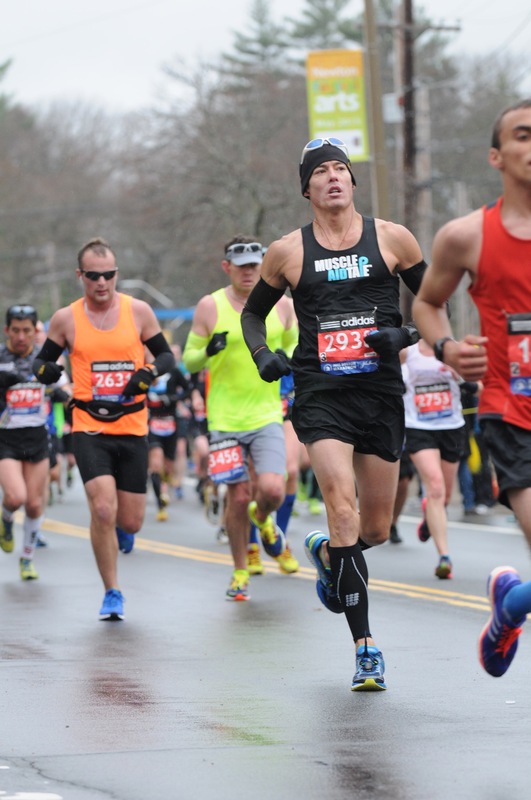 At Mile 21 is Heartbreak Hill. It’s not that the hill is very difficult to ascend. It’s that it’s a long hill that was placed at Mile 21. See, at Mile 3 it’d be fine. At Mile 21 it’s simply diabolical. Both quads are achy, both hamstrings are like muscle-spasm ninjas hiding in the darkness, crouched and ready to strike. 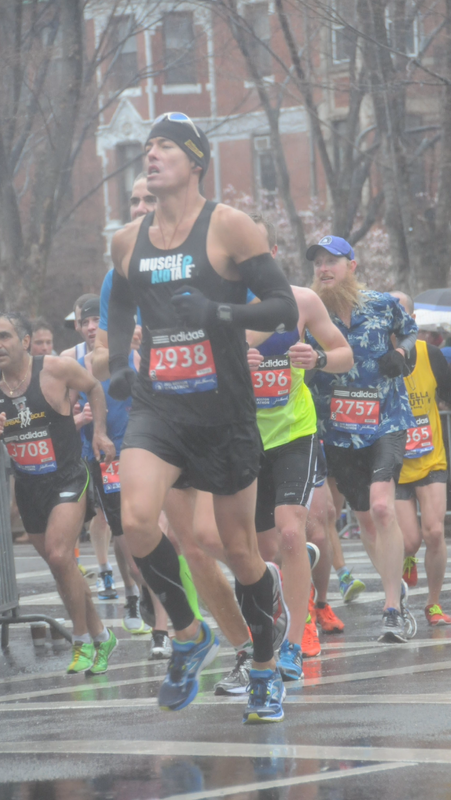 What’s also challenging about the end of a marathon is how hard you have to work to go slower than you were going in the beginning when everything was easy. 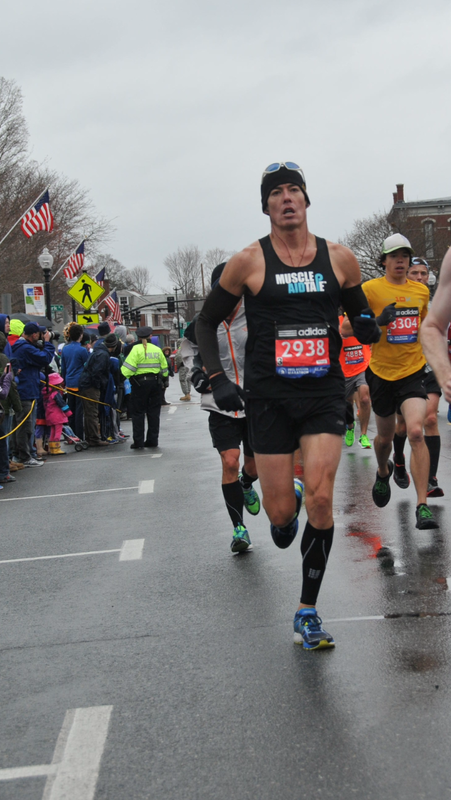 At Mile 5, a 6:30 pace was almost effortless. Now, at Mile 21, my face is contorted, my legs are screaming, and I’m absolutely burying myself to hold a 6:50. But it keeps slipping away. Another mile, this one at 7:18. Slow mile times compound. They crush dreams. One is an anomaly. Two are cause for concern. Three, and your day is done. And it’s not that finishing in 3 hours is bad. It’s leaving anything in the tank that’s bad. It’s dialing back your effort because it hurts. Because you might cramp. Because you’re afraid to fail, to go for broke, afraid to acknowledge how there will never be a perfect time to be great. You need to create perfect moments. And to deny yourself, to sabotage yourself, to give up before you’ve actually lost . . . that’s bad. It was time to get ugly. I had my moments on the course where I was gliding, where I felt Kenyan, where I was a gazelle darting about, fleet-footed. Now it was time to tell the little cry baby in the back of my brain to shut up. It was a Jens Voigt moment: “Shut up legs!” If there’s a monster lurking in the depths of your psyche. If there’s a beast who’s grown restless. Now’s the time to let him out. Mile 22 became Mile 23. Mile 23 became 24. And when I reached 25, I knew it’d be close. My average pace crept up from 6:35 to 6:50. Anything over 6:51, and I knew what that meant. It meant that lots of people would congratulate me on a race that I would be secretly angry about. Frustrated. Disappointed. All because of a few seconds that could’ve gone one way or the other. But none of this would fly. Not in the dark of night, at 3 AM, where it’s just you, alone with your thoughts. You can’t escape those moments. And they visit us all. I had 1.2 miles to go. The on-course race clock was not accurate, as it was set for the professionals, who went off about 90 seconds before I did. So I cycled through the screens on my Garmin. For some reason, the data field with the overall time was not coming up. I could get the hour and minute, but not the seconds. It currently read 2:53. I had fewer than 7 minutes to go 1.2 miles! I suppose it’s nice to have a now-or-never moment. This was mine. It was, as they say, time to go big . . . or go home. I pushed from that place deep in your core, where you push so hard that you might lose control of your bodily fluids. It was a full abandonment of form. If one can run on heart alone, with nothing but will, to put yourself out there, to go all in, to realize that if you fail, you’re going to fail big. 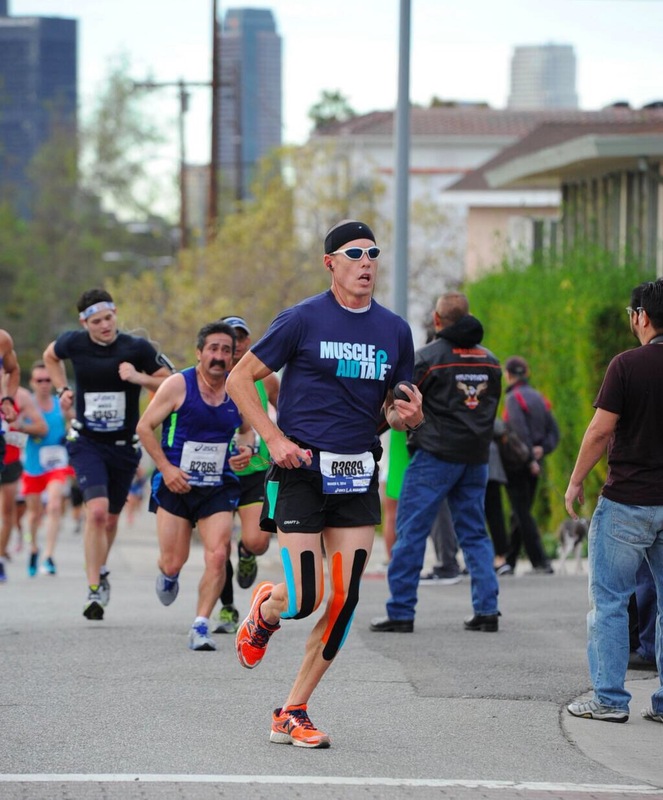 You’ll fall forward, legs seizing, runners cutting left and right to avoid toppling over you. This is where the two extremes meet. This is where truth and sport collide. This is everything. So you hope. You have faith. You believe. You look down at your Garmin. It reads 2:59. You didn’t see it tick over from 2:58. How long has it been at 2:59? No seconds are revealed. At least 100 yards remain to the finish line. You sprint. You are fully committed now. You have to reach the line before your watch reads 3:00. I’ve been assured that the crowd was roaring through the finishing chute. But for me, it all went quiet. I couldn’t even hear my music. It was an all-out sprint that ended with me crossing the line and doing what I could to avoid smashing into the guy who crossed the line just before me. When I hit Stop, my watch still read 2:59. Whether or not this was consistent with the official results was something I wouldn’t know for another hour or so. It took about 2 minutes before cold became freezing. And then bone-chilling. And then downright unimaginable. I was all thumbs, gross-motor skills, just trying to get to my morning clothes bag, which was approximately a half mile up the road. The last time I was this cold was in 2004, when I snuck onto the Great Wall of China at 3 AM in February, with snow along the Mongolian side of the wall, in an effort to see a sunrise from Simatai (the highest part of the Great Wall). When I sat in that guard tower, so cold, so cold, I was no colder than I was in the minutes after the Boston Marathon. 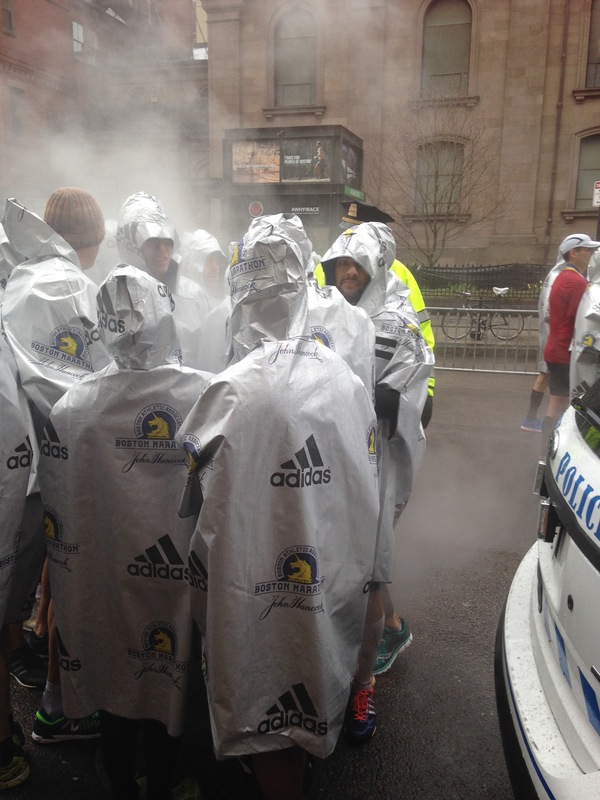 The volunteers gave the athletes an Adidas poncho, which helped, but I was soaked. And freezing. And that’s when I saw it: 5 guys huddled around a grated manhole cover. Steam was rising from the sewer or the subway or someplace. I penguin-walked up to the guys, and they kindly shuffled enough to open a space for me. The steam rose through the grate, and I felt like I’d been transported to a meditation retreat in a place like Sedona where a Shaman conducts purification rituals. Standing there, opening the poncho to guide steam onto my legs, through my shorts, enveloping my chest and face in an embrace I’ve perhaps never before felt — that was one of the best feelings. Ever. Nobody spoke. It was primordial. There were just “ahhhs,” “ohhhs,” and an intonation that oozed a sort of thankfulness, gratitude, acknowledging that someone or something must be looking out for us. We were King Henry’s men. “We few, we happy few, we band of brothers”. I finally left our makeshift sauna to go get my morning clothes bag. In it was my phone. And on it was my finishing time. 2:59:30. 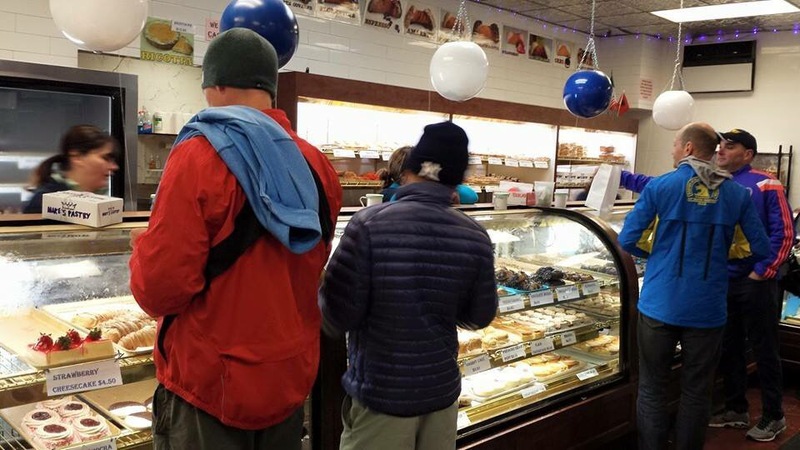 That evening we went to Mike’s Pastry Inc. (Keish and I were too focused on Boston Cream Pies to bother posing for a photo). 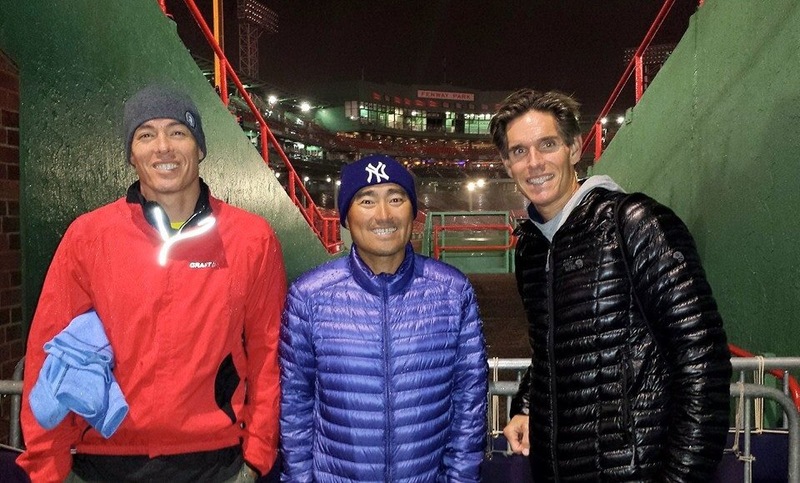 And then we went to Fenway Park for the Boston Marathon After Party (otherwise known as the 27th Mile). Good times with great people. 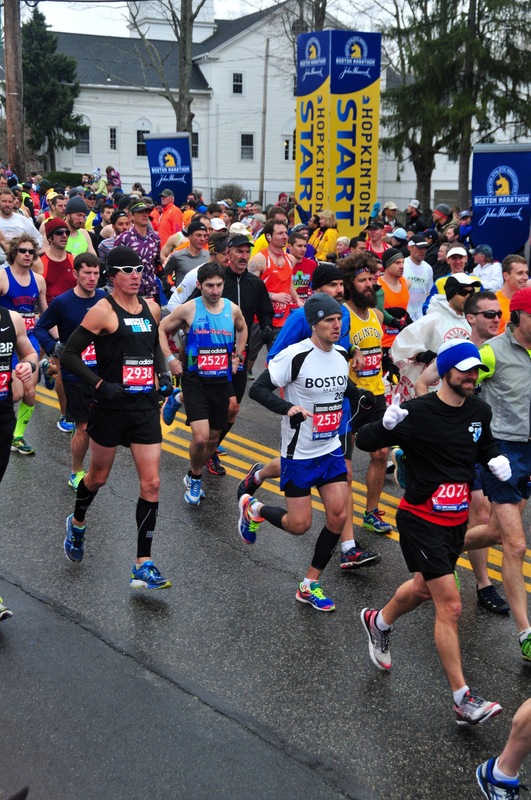 If you have a dream catcher, align it with the Boston Marathon. It’s a dream worth pursuing. 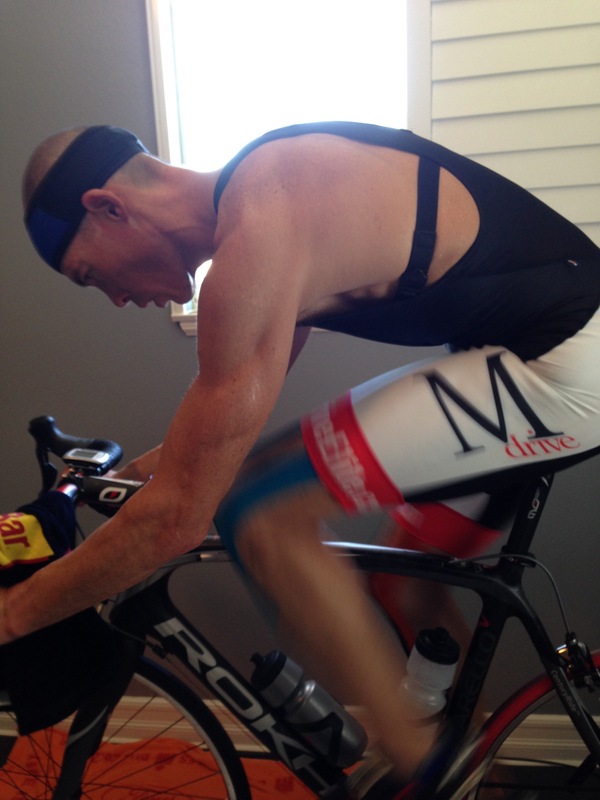 Big thanks to TriBike Transport, Mdrive, and MuscleAidTape. Great job Jason. 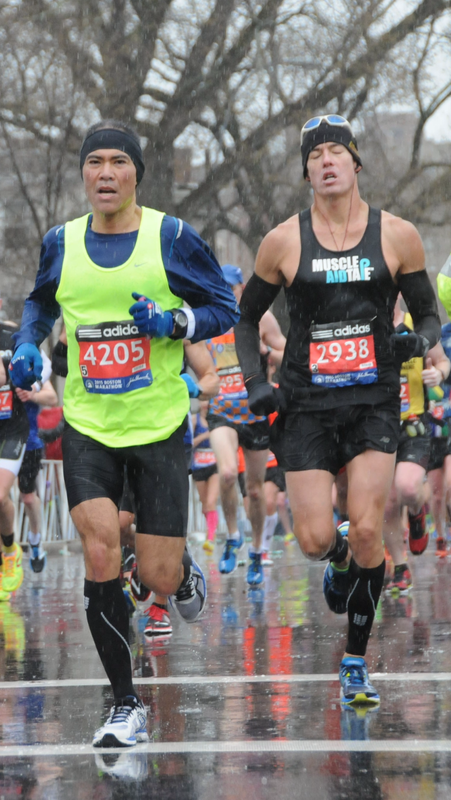 Sub 3hrs at the Boston Marathon in those conditions is a great accomplishment. Very well written race report as usual. Really interesting perspective from the triathlete in the crowd. Love having you on the Mdrive Ambassador Team.